Doctor Thorne opens with the events of twenty years before. Henry Thorne seduces Mary Scatcherd, sister of the local stonemason. When she becomes pregnant, her brother, Roger, beats Thorne so badly that he dies. Tried for murder, he is convicted of manslaughter when the facts of the case became known, & serves six months in jail. Henry Thorne's brother, Thomas, is the local doctor, a steady, sober man in comparison with his wicked brother. Dr Thorne pities poor Mary Scatcherd in her sad situation. When Mary's former suitor still wants to marry her & emigrate to America, he does so on the condition that she leaves her daughter behind. Dr Thorne pledges to bring up baby Mary & care for her & Mary Scatcherd agrees. Twenty years later, Mary Thorne has grown up beautiful, kind & the apple of her uncle's eye. She was sent off as a little girl to be educated but has lived with her uncle since she was 13. She is on terms of friendship with the local squire's family, the Greshams of Greshamsbury. Doctor Thorne is a friend of the Squire & is tolerated by his haughty wife, Lady Arabella, who never forgets that she is a member of the De Courcy family of Courcy Castle. Squire Gresham has squandered the fortune left him by his father. His daughters will have tiny dowries & his only son, Frank, will have to marry well to hold on to what's left of the estate. Marrying well means marrying money & Lady Arabella is soon scheming with her sister-in-law, Lady de Courcy, to bring this about. Lady de Courcy has invited Miss Dunstable, heiress of an ointment fortune, to Courcy Castle, & wants Frank to marry her. Frank Gresham is a nice boy, that's the only way I can describe him. Fond of his family, conscious of his father's perilous financial position, loyal to his friends & eager to do the right thing. Frank is also in love with Mary Thorne. Lady Arabella has always disapproved of Mary's intimacy with her children, not only because she has no money. Her ambiguous social position is also a problem. The sad story of her parents has been forgotten by many & the young Greshams & Mary herself have no idea that she's illegitimate. However, once Mary is of an age to marry, she begins to ask her uncle questions about her origins. Roger Scatcherd, the stonemason, has prospered. He is now a rich man, a baronet, living at Boxall Hill, land that once belonged to Squire Gresham, but was sold to pay debts. Scatcherd has been a friend of Doctor Thorne's ever since the terrible events of twenty years before. Doctor Thorne helped Scatcherd's wife & child while he was in jail but the Scatcherds know nothing about Mary. Sir Roger's health is poor because he's an alcoholic. 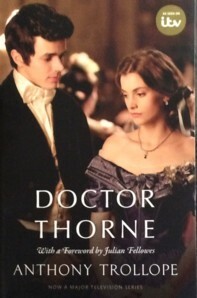 His drinking bouts & irrational rages are undermining his constitution & he refuses to listen to Doctor Thorne's advice. Doctor Thorne has never told Sir Roger about Mary because he fears that the Scatcherds would want to take her away from him. He knows how unhappy Mary would be with Sir Roger & his wife & so he says nothing. However, when Sir Roger, after another bout of illness, makes a new will, leaving a fortune to his sister Mary's eldest child, but without naming the child, Doctor Thorne, as executor of the will, must tell Sir Roger the truth. The will leaves this eldest child the money if he or she outlives Sir Roger & his dissolute only child, Louis Philippe, who will inherit when he turns twenty-five. Doctor Thorne is faced with a terrible dilemma. He knows that Mary & Frank are in love. He believes it is probable that Sir Roger will soon be dead as he refuses to stop drinking. Louis Philippe is well on the way to emulating his father & could very well die young, leaving Mary a considerable heiress. Sir Roger refuses to amend the ambiguous wording of the will. Should Doctor Thorne tell the Greshams of Mary's possible inheritance in the hope that they will allow Frank to marry her? What if Louis Philippe reforms & lives to a ripe old age? Frank & Mary would be left with nothing. I loved this book. This was actually a reread as I read the Barsetshire novels over 30 years ago. I was prompted to reread it because OUP kindly sent me a review copy of the new edition. We haven't seen the new TV series here yet but I'll be interested to see it when it makes an appearance. After 30 years, it was like reading a brand new novel anyway. I was especially taken with the good humour of the narrator. I thought of him as Trollope just as I think of the narrator of A Christmas Carol as Dickens & I kept thinking of Trollope standing in the spirit at my elbow (as Dickens writes when the Ghost of Christmas Past visits Scrooge). Doctor Thorne is also a very funny book. Whether it's the satire of Lady Arabella & Lady de Courcy's attempts to find a rich bride for Frank & his attempts to evade them or Augusta Gresham's miserable engagement to Mr Moffat which ends with Frank horsewhipping him, much to the Squire's approval, the tone is amused & genial. Trollope's descriptions are also pithy & very amusing. He describes Mr Winterbones, Sir Roger's confidential secretary as "a little, withered, dissipated, broken-down man, whom gin and poverty had nearly burnt to a cinder, and dried to an ash." He still tries too hard with some of his character's names, Dr Fillgrave, Miss Gushing, the easily bribed publican Mr Reddypalm & the political agents Mr Nearthewinde & Mr Closerstil. Doctor Thorne himself can be as prickly as his name when he feels he's being slighted & Mary had spirit & wit, she's no simpering young miss. I especially enjoyed her encounter with Lady Arabella where her pertness is on a par with Elizabeth Bennet's when she is confronted by Lady Catherine.There's also a very funny & satirical chapter consisting of letters between Augusta Gresham & her cousin, Lady Amelia. I don't think I remember another Trollope novel where the narrator is so very present with comments & asides. There are some implausibilities in the plot. I can only think that Sir Roger's brain had been scrambled by drink for Mary's identity to be such a surprise to him. Doctor Thorne had only one sibling, Henry, & Scatcherd knew his sister was pregnant when Henry died. Even though he was told the child was dead, where did he think the doctor's niece had sprung from? Also, I would think that Mary's illegitimacy might invalidate the terms of Sir Roger's will without all the agonising that the Doctor goes through about what to tell the Greshams. Actually Trollope amusingly heads off any legal quibbling by boldly stating that if the terms of the will are incorrect, they've just been wrongly described! The critics had been scathing about the legal detail of his previous novel, The Three Clerks, so he was getting in first in Doctor Thorne. Still, surely Mary Scatcherd's legitimate American children would have challenged the will? Anyway, it's Trollope's story & he tells us in so many words that it's his world & he'll do what he pleases with his characters. I couldn't help wondering what Wilkie Collins would have done with the same material. Trollope lays everything out for us so that by about Chapter 10 we know all about Mary's parentage, the terms of Sir Roger's will & the potential implications for Mary & her marriage to Frank. We then have another 35 chapters where Doctor Thorne works through every possible moral implication of these circumstances. His scruples won't allow him to neglect Louis when he's made an unwilling trustee of the estate, or raise Mary's hopes by telling her of her possible inheritance.Wilkie would have made a mystery of every part of it with cliffhangers galore & I would have been on the edge of my seat. However, I was surprised how suspenseful the book was, considering that I already knew all the secrets & had a good idea of the ending. I read it over Easter & was glued to my chair for hours at a time. Very intriguing! There is a BBC series from this book on right now! Yes, I'm hoping we'll see the series here in Australia at some point. Its on ITV, not BBC, sorry :( I'm sure it will make it over there! I think this was my favorite (or at least second favorite) of the six Barsetshire books. 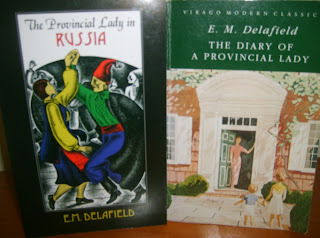 I loved the 'secondary' characters, too (Miss Dunstable, Miss Oriel). I've heard mixed things about the TV production (for example, that they made Miss Dunstable too young, too pretty and (gasp!) American... which misses the point entirely. :) I still hope we see it here too. I think it could be read as a stand-alone too because the Bishop etc only make token appearances. The mixed reviews of the series are a concern (I believe Lady Arabella sounds like Maggie Smith's Dowager Countess!) Still, I'd like to see it.